The Tzu Chi Philippines branch office held a free medical clinic in Tacloban, the capital of Leyte Province, in late October 2018. This was the fourth year in a row that Tzu Chi had conducted such an event in Tacloban. The foundation began providing aid to residents in the city after Typhoon Haiyan ravaged the central Philippines on November 8, 2013. The latest free clinic was staffed by 108 medical volunteers and 341 support volunteers from Taiwan, Singapore, Malaysia, and the Philippines. They offered services in surgery, dentistry, pediatrics, ophthalmology, internal medicine, and traditional Chinese medicine from October 26 to 28 at Leyte Progressive High School. People started arriving after midnight for the first day of the clinic. They arrived so early because they were anxious to receive treatment at the free event. Many locals are too poor to afford medical care, so they didn’t want to miss this good opportunity to see a doctor. Just pulling a tooth can set them back a month’s salary. Given that, it was no wonder that a woman who came to the event had suffered from a toothache for two years without seeking medical attention. The clinic served over 6,000 patient visits in three days. The massive throngs of people needing treatment each day kept the doctors and nurses so busy that they didn’t even have time to take a break and have some water. Despite that, they felt hugely rewarded whenever they saw a patient break into a smile after having his or her illness treated. Due to the limited space and time of the event, Dr. Antonio Say, of the Philippines, led a team to hold a two-day eye clinic ahead of the three-day event. That clinic was offered on October 23 and 24 at Divine Word Hospital, where Say and other ophthalmologists performed surgery on 152 patients. People who had their cataracts removed were thrilled to be able to see clearly again. Volunteer Rowena Rempillo bustled about at the free clinic at the local high school. She was a victim of Typhoon Haiyan. Five years ago that devastating disaster badly damaged her home, and she herself nearly drowned in the floods. She was so badly traumatized from her brush with death that she sought psychological therapy and couldn’t return to Tacloban. Some time after the disaster, she heard from her sister, who had returned to Tacloban, that she had received aid from Tzu Chi and that the foundation had implemented a work relief program to help bring the disaster area back to normalcy. In 2015, Rowena finally returned to Tacloban, where she saw that Tzu Chi volunteers were still helping her fellow townspeople. She was deeply moved and delighted. When Tzu Chi held a free clinic in Tacloban that year, she signed up as a volunteer. For three years after that she continued to help at such clinics. She is now the coordinator for people in the city who have started training to become certified Tzu Chi volunteers. She thanked the foundation for helping Tacloban pass the hard times after the typhoon and for changing many people’s lives. Many people are still in need of help in Tacloban. Tzu Chi volunteers will continue to provide care and assistance and inspire more local people to join their ranks to serve their own fellow townspeople. Tzu Chi volunteers in Cambodia held a rice distribution at the Dangkor landfill in Phnom Penh on November 20, 2018. The event was aimed to provide relief for families who scavenge garbage for a living. The volunteers have been helping local residents for some time, so the two sides interacted very warmly at the distribution. Many residents brought their coin banks to donate to Tzu Chi. They said that saving one hundred riel (two US cents) a day would not affect their lives, and that the money could be used to help other people, so they were happy to contribute what they could. When volunteers announced at the venue that they needed people to help unload and move rice, 30 residents quickly stepped up. Volunteer Chen Ni Bi-yun (陳倪碧雲) remarked at how warm-hearted the residents were. Despite their difficult lives, they were quick to render a helping hand. Five hundred families received rice at the event. The Cambodian Water Festival, an important local holiday, was coming up; volunteers hoped to help the recipient families have a better holiday by providing them with the aid. Three residents had died earlier in the same month from an accident with a garbage truck while they were scavenging. A group of volunteers decided to visit the bereaved families the day after the distribution to determine if they needed any assistance. The volunteers first visited 44-year-old Oeung Arm, whose husband had died in the accident. The couple had five children, and Oeung Arm was pregnant with their sixth. The volunteers decided to help this family by giving them rice and powdered milk every month for half a year. They will evaluate whether to continue with the aid when that time is up. After that, the group went to 37-year-old Srin Sitha’s home. Her husband had also died in the accident. Now she was the only one working in her family of seven. The volunteers decided to give this family 40 kilograms of rice every month for half a year before assessing the need of further aid. Volunteers then visited 47-year-old Mut Thon, whose wife was another victim of the fatal accident. The couple’s son and daughter were both grown, and they scavenged with their father to make a living. Since the family was able to get by on their own, the volunteers decided just to visit them regularly to extend care to them. During their visit to the landfill on this day, volunteers learned that five local children were in need of school uniforms and supplies. On November 28, volunteers visited the area again to bring newly purchased uniforms and school supplies to the children. 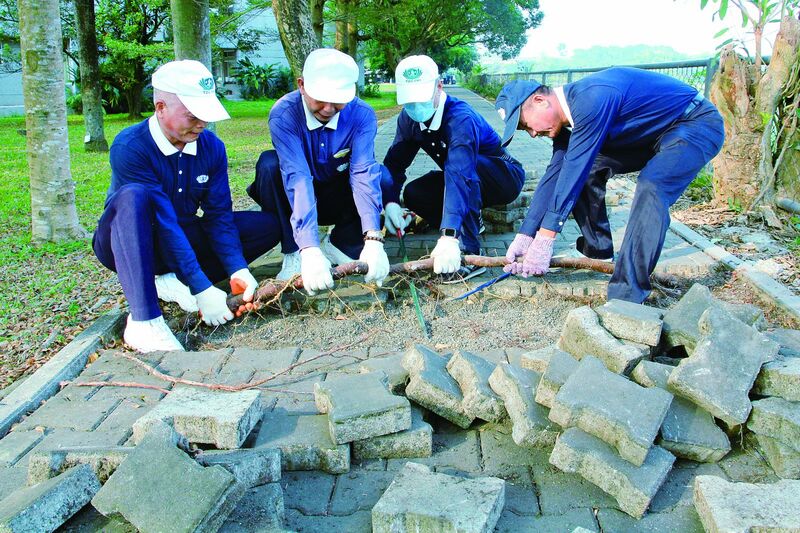 On November 17, 2018, over 80 Tzu Chi volunteers gathered at Da Ji Junior High School in Chiayi, southern Taiwan, to repair some pavement on the campus. The volunteers intentionally chose a weekend to carry out the project so as not to disturb the school faculty and students. Tzu Chi’s connection with the school started 19 years ago, in 1999. On October 22 that year, a magnitude 6.4 earthquake heavily damaged most of the school buildings, rendering them unfit to be used again. After an on-site inspection, the foundation decided to help the school rebuild. Lush green trees had abounded on the campus; during reconstruction, the trees were carefully preserved. Over the 19 years since the school was completed, the trees had grown bigger, denser, and more eye-catching. However, their roots had grown as well, not just deeper into the ground but also wider around. Under the trees and around the campus was a 350-meter-long walkway laid with interlocking pavement bricks. The overgrown tree roots had damaged the pavement and caused protrusions in many spots. The school parking lot was laid with paving bricks too. After years of being run over by vehicles, some areas had also become uneven and bumpy. Out of a concern for the safety of teachers and students, school administrators asked for help from Tzu Chi in October 2018 to fix the bumps in the pavement on campus. Volunteer Huang Chun-xiong (黃春雄), who has a background in construction, carefully evaluated where to saw off overgrown roots without hindering the growth of the trees. The aroma of camphor wood filled the air as he sawed off one root after another. Volunteer Wang Shou-rong (王壽榮) went about the campus helping to take out bricks and transport gravel and sand with a wheelbarrow. He was one of the volunteers who had visited the school to check out the pavement after Tzu Chi had received the request to fix it. He said that they had originally estimated a required workforce of 15 volunteers, but when they sent out the message to enlist volunteers for the project, over 80 people signed up. The extra hands were a godsend because tree roots had spread under many paving blocks, making the project more difficult than anticipated. The volunteers’ clothes soon became drenched with sweat under the autumn sun. Everyone mindfully went about their job, and by the time they finished, at two-thirty in the afternoon, the re-laid areas looked perfectly even and smooth. Volunteers had even taken care to brush clean the bricks before laying them down! Principal Shao Bing-ying (邵冰瑩) thanked the volunteers for a job done so well and quickly. The volunteers, on the other hand, were more than happy that the students now have a safer environment to learn in. In early October 2018, heavy rains lashed parts of Central America, resulting in flash floods and landslides. Honduras was among the countries most severely hit. Most damage in the country was reported in Francisco Morazán, Valle, and Choluteca departments in the central and southern parts of the nation. Tzu Chi volunteers living in the flooded areas were victims themselves, but they quickly put their homes in order and began surveying damage in the disaster area and compiling rosters of victims who would receive aid from Tzu Chi. 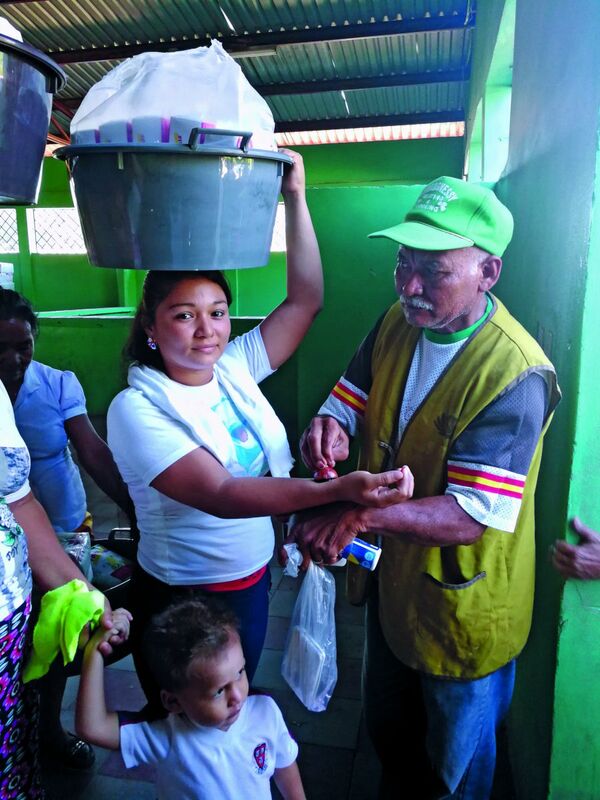 Distributions were held on October 24 and 25 in Marcovia, Choluteca Department, and on October 26 at the Tzu Chi Great Love Village in Choluteca, the capital city of Choluteca Department. The events on the three days benefited nearly 5,100 families, each of which received 12 items, including spaghetti, corn starch, red beans, cooking oil, laundry detergent, chlorine water, and a large plastic washbasin. The food could last a family of four seven to ten days. Volunteers at the venues carefully checked the recipient lists and the IDs of the attendees to make sure that the aid went to the right people. The weather was hot; two physicians from the local chapter of the Tzu Chi International Medical Association were on hand to provide medical services to anyone who might suddenly feel unwell in the heat. Many attendees, worried that they might not receive their share of the distribution goods, pushed forward in the lines, and volunteers had to work hard to restore order. Jorge Chang (張鴻才) was the head of Tzu Chi Honduras; his voice was hoarse after helping maintain order for three consecutive days at the venues. Volunteers felt for the flood victims, who had to stand and wait for several hours to receive their goods. They prayed for a world free from disasters so that there would be less suffering in the world. 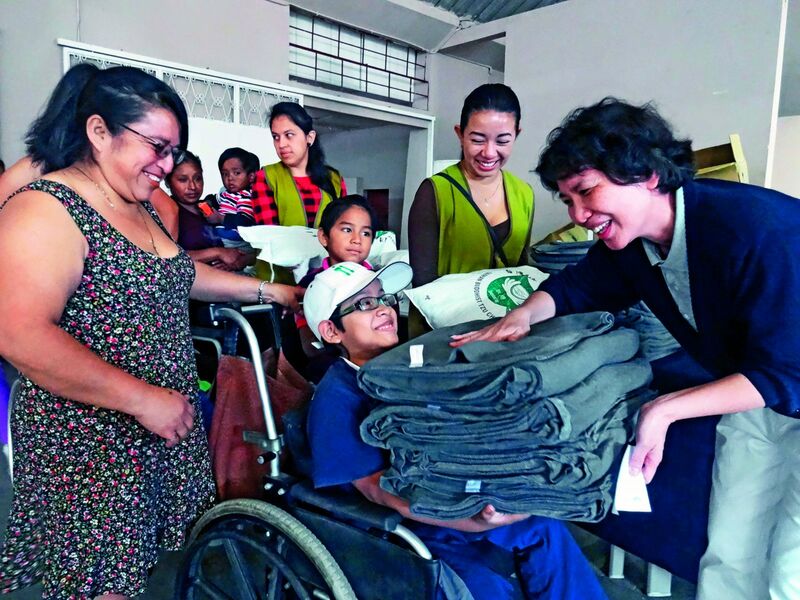 Tzu Chi Guatemala held its second winter distribution in 2018 on December 2 at a Palencia city government activity center. The aid recipients consisted of 61 families with disabled children and 30 families that make a living by salvaging garbage at a landfill. The families with disabled children had been referred to Tzu Chi for help by the Palencia city government. Volunteers had personally visited these impoverished households in February 2018 to assess their needs. As for the other 30 families, volunteers had been providing aid to them since 2016. Distribution items included folding beds provided by a Taiwanese chamber of commerce, blankets made from recycled plastic bottles, black beans, and biscuits. More than the material aid, volunteers hoped to convey warmth and care to the recipients in the coldness of winter. Beralba Celeste Morales, 20, suffers from a medical condition that affected her spinal cord. Despite her disability, she was upbeat and thoughtful. She warmed the hearts of the volunteers who interacted with her. 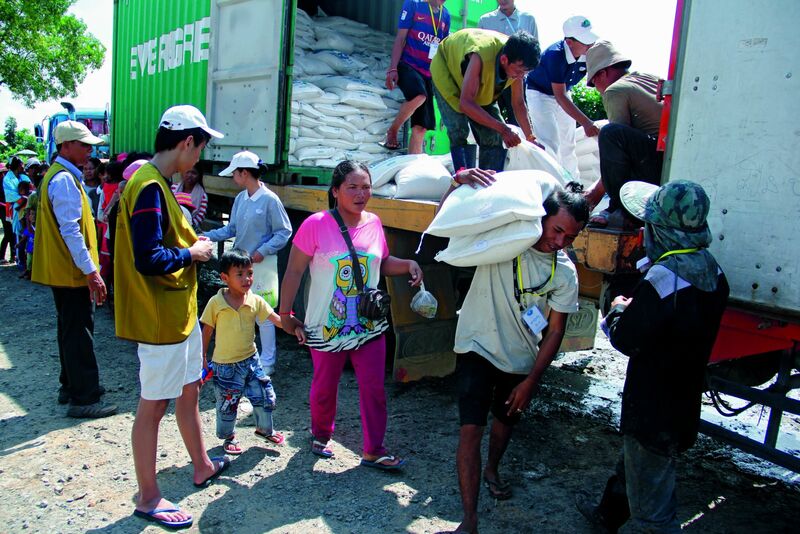 The city government arranged for vehicles to help the recipients take their distribution goods back home. Everyone worked together to help the needy families have a warmer winter.